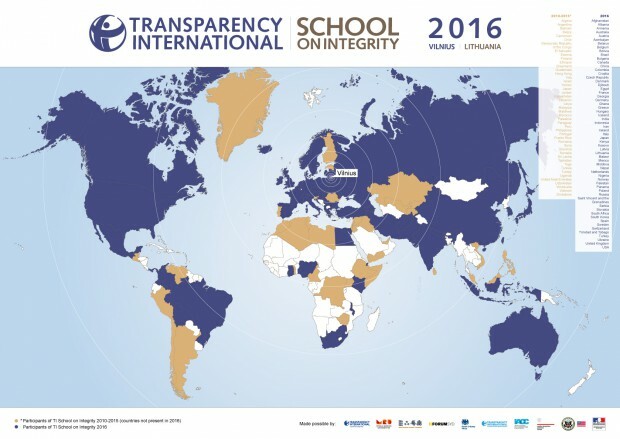 The Transparency International Summer School on Integrity is a week-long series of lectures, seminars and workshops where students analyse corruption in different sectors and fields, reasons for its existence and its consequences, the desirability of transparency and other corruption-related topics. The aim of the Summer School is to provide student leaders from across the region with the opportunity to learn first-hand from experts in the field of anti-corruption. The School seeks to provide students with peer-to-peer learning and an integrity-building platforms to connect international experiences of transparency and integrity to the existing situations in post-communist states. Participants of the Transparency International Summer School on Integrity learn about the causes of corruption and practical ways in which post-communist countries can become more transparent and accountable. The Summer School on Integrity consists of 3 modules: the public sector, the private sector and civil society. Each module consists of a theoretical analysis of corruption, its influence on different parts of society and how anti-corruption measures are implemented in practice. Lecturers and speakers offer students state-of-the-art professional guidance and compelling case studies that show the long-term benefits of transparency and integrity. Led by experienced anti-corruption professionals, the School aims to create an environment where discussions about transparency and integrity at the highest echelons of public policy would be brought into the classroom and everyday life of students. University students earn 6 ECTS credits upon the successful completion of the course. Language of instruction – English.